Rent-A-Center contracts can be confusing, with fees and other riders that could hurt a renter’s credit, NerdWallet and Raycom Media found in reviewing thousands of consumer complaints to state and federal agencies across the country. Consumers say they are routinely stuck with payments, damaged credit and calls from debt collectors. 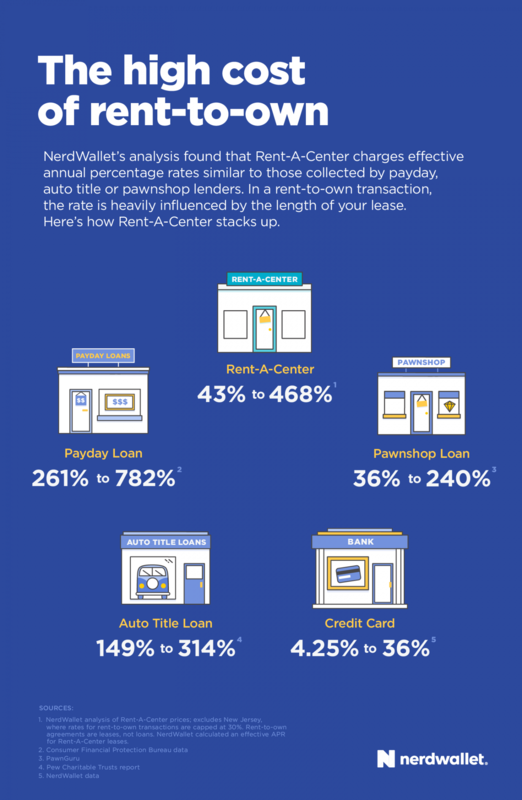 In 40 states and the District of Columbia, Rent-A-Center stores charged an average of twice as much for products as a consumer could find at a comparable retailer, NerdWallet’s analysis showed. Reporters compared the terms of Rent-A-Center leases with other expensive forms of consumer lending, such as payday loans, car title loans and pawning goods. Although rent-to-own agreements are leases, not loans, and don’t accrue interest, NerdWallet and Raycom calculated an equivalent annual percentage rate.